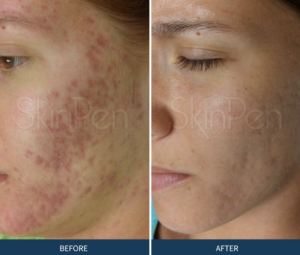 Put SkinPen Microneedling to Work for You. and up. 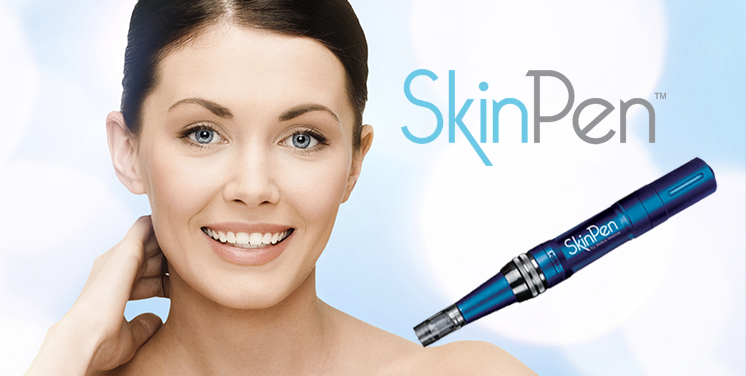 SkinPen creates controlled micro-injuries to stimulate the body’s natural wound-healing process, while minimizing cellular damage. The result: effective remodeling of scar tissue, while keeping the overall structure of the skin intact. Do not exercise the day before or for 24 hours after the injection treatment. Avoid medications such as: Aleve, Advil, ibuprofen, cold remedies, Vitamin E or aspirin 5 days prior to treatment. Avoid Retin-A, chemical peels, injectable fillers or Botox for 2 weeks prior to treatment. Notify medical staff if you have had cold sores. You will require an anti-viral prescription to avoid any breakout after treatments. The procedure cannot be performed if you have open cuts, wounds, abrasions or are currently experiencing any acne or cold sore breakouts. What to expect: Day 1: Skin will be red and flushed after micro-needling, depending on the intensity of the treatment. Pinpoint bleeding may occur. Do not apply makeup for at least 12 hours. Day 2: A red or pink hue persists like moderate sunburn. Swelling and slight bruising may be more noticeable on the second day. Minor scratches may be visible. Apply moisturizer as needed. Day 3: Skin can be pink or normal color. Swelling subsides. The skin can feel dry or tight. A slight outbreak of acne or milia (tiny white bumps) is possible. Light peeling usually occurs in about three days and will be replaced with brand new skin. Wash with a gentle cleanser using your fingers only. Gently massage the face with lukewarm water. Remove serum and other debris such as dried blood. Do not scrub, use a wash cloth or a Clarisonic brush. Cleanse treated areas twice a day. Do not use exfoliating products for 72 hours. Apply 1% Hydrocortisone cream or Benadryl spray or gel on treated areas to reduce itching or redness. You may apply Arnica Montana up to 7 days after each treatment to decrease bruising and inflammation. Do not exercise for 24 hours after treatment; no strenuous exercise for the next 48 hours. Avoid saunas, steam rooms, hot baths or showers until redness is gone. Continue to avoid sun exposure to the treatment areas and apply a broad-spectrum sunblock with SPF (minimum of 30). Apply it at least 30 minutes prior to sun exposure and repeat after every two hours of sun exposure. After 2-3 days you can return to regular skin care products or as soon as it is comfortable to do so. Mineral makeup may be applied the following day. Avoid waxing, facials, Botox, injectable fillers or any other skin care treatment for two weeks after your procedure. New cell regeneration requires at least 6-8 8oz. glasses of water a day (if you already drink that, increase by 2 glasses). If skin becomes painful, swollen, red or inflamed, please notify us immediately as this may represent an infection or allergic reaction that may require treatment. A tube of “Lift” and “Rescue” will be provided to you for your post Skin Pen care. You may wash your face with water and mild soap later today. Before bed, you may apply the “Lift” for any discomfort or redness you are experiencing. The morning after washing your face, apply the “Rescue”. You may use this daily on your face until the tube is empty. Before going out for the day, apply a sunscreen which is made up of titanium dioxide and zinc oxide. Skin Medica makes such a product called “Essential Defense” and we have it available for purchase, as it has the ingredients recommended for use after Skin Pen. Apply sunscreen daily to protect your face. You may put on make-up after 24 hours, over the Rescue and Sunscreen. During the next 2 weeks it is recommended that you avoid direct sun exposure. The easiest way to do that is by wearing a hat with an SPF 50 built in, when you are outdoors. You can find them at your sporting goods store, at swimwear stores, and some gardening centers/nurseries. If you are having multiple treatments, you need to wait a minimum of 4 weeks between each Skin Pen treatment. By following the above protocol, you will receive the maximum benefit from your Skin Pen treatments.